Haven’t we all? But in my case I have a newspaper clipping to prove it. Among the people whom I feel might be interested are those who have taken longer than they wanted to realize that there is a reason for them being embodied in this world as it plummets into chaos. (Or as the Tibetan Buddhists term it, this time of the Kali Yuga). Personally, I am trying to believe that this mounting global catastrophe is avoidable and that if enough of us awaken to the opportunity we have been given as human beings (which the Tibetan sage Longchenpa calls our precious human embodiment, as hard to find as the chance of a blind tortoise swimming in the ocean slipping its head into a floating yoke), then we will be able to preserve this planetary home over which the Bible has given us stewardship. Like Little Bo Peep’s sheep, I was lost and now am found, through the happy discovery that I was home all along. It seems that many are stumbling upon this discovery with help from Eastern spiritual traditions and from western teachers such as Eckhart Tolle. They have found ways to survey the landscape of 21st century Earth through new eyes, drawing upon nuggets of ancient healing wisdom, and now feel gratitude that they encountered whatever is helping them to pull free from confusion and despair. 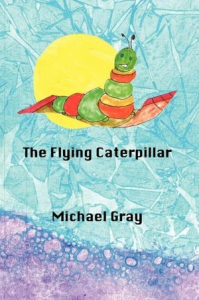 The Flying Caterpillar tells the story of my own idiosyncratic confusion and despair and of how I was rescued, against all odds, through a combination of the wisdom of fellow human beings, the world’s wisdom traditions, and the inspiration that both have seeded in me. Not everyone will be interested in these footnotes of my own spiritual journey. My friend who lived across the street in our west-end suburb of Montreal, and whose books sell in the tens of thousands, told me that he was interested in learning more about my state of mind during the years we hung out together, but that the rest of it left him pretty lukewarm. So fair warning: my memoir has entire chapters in which I celebrate the works of George Gurdjieff, Tibetan Buddhism, the plays of Sophocles (especially Philoctetes, which anticipated our modern vision of individual freedom), the extraordinary “Time, Space, Knowledge” vision of Tarthang Tulku, fables (including dialogues between the industrious ant and the impetuous grasshopper), riddles and paradoxes (such as Zeno’s race between Achilles and a venerable tortoise which neither can win because of a rather odd way of looking at time), Dostoyevsky, Kafka (always Kafka), the four epic poems (but especially Paradise Lost), George Steiner (who saw the holocaust as evidence that the humanities can no longer be counted upon to humanize), Eckhart Tolle, Zen and the Art of Motorcycle Maintenance (which has a single moment and a single word on which everything turns) — to name a few of the works, also listed in the bibliography, which have helped pull me toward the recognition that I am finally happy to be alive. Among people whom I feel would be interested in The Flying Caterpillar, if they knew about it, I include director James Cameron. I sent him a copy, not because I thought it would make a good movie but because it contains a five page appreciation of his films. I point out that the protagonist of Avatar is himself a flying caterpillar: when he arrives in the new world he is a paraplegic marine who can only crawl without his manual wheelchair. I am interested in wheel chairs and those who drive them because I have worked with people who have MS and ALS for two decades with my friend, Foster, who himself has ALS, and about whom I have written (Friends in Time about our organization and Tuesdays with Foster about my friend). In Avatar, the disabled marine gets to “fly” in the body of a Navi, but his Intel destroys the way of life of the civilization to whose wonders he has begun to awaken. Now he may be flying but he very much remains a caterpillar when it comes to his unevolved inner being. It is through an inner awakening that he finally takes flight. He sacrifices his own freedom (including the healing operation that he has been promised when he returns stateside) and — as the New Testament proposes — he at last exchanges an old life for a new life. Why do I myself not aspire to be transformed into a flying “butterfly”? Because I am a being of Gaia who doesn’t know how to prevent the madness that is destroying the Paradise that is our home and which it is our specie’s moral imperative to protect. I do not want another home and, as The Flying Caterpillar makes clear, I do not believe that we who are alive today are entitled to another finer realm until we learn to take better care of this one. Time also emerges as a character in this story. If the past is dead, the future not yet born, and the present rushes down the drain the instant that it arrives, where and when are we to spend our lives? Or in Eckhart Tolle’s language, how can we learn to reside in the “now”? Perhaps a first step is to look at the three times in a new light: the future is like the breeze that stirs the curtains, bidding us to look outside, the past the chair from which we arise, and the present the doorway through which we step forth upon the journey of our lives.